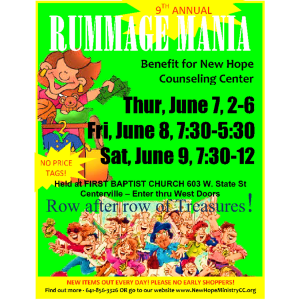 It’s Time for Rummage Mania! And it’s Earlier this Year! New items will be set out each day! New Hope is getting ready for our biggest event of the year! You’ll find treasures galore as you walk the aisles. Table after table will be piled high with everything imaginable. The back room resembles a department store, filled with clothing and shoes in every size, style, and color. We have so much each year; we want everyone to know that new things will be put out every day. This community event blesses everyone. Donating your unwanted items helps you clean out some clutter, and makes you feel good about giving to such a worthy cause. It helps not only the local mission work of New Hope, but the hundreds of customers that come to find needed items, or just something fun they might not otherwise be able to afford. Among the treasures, you can sort through boxes of books, mounds of movies, piles of purses, and holiday decorations of all kinds. And for all you guys out there, they have some man cave stuff you’ll want to check out. Loads of items get dropped off from the wonderful people of our local communities, helping to make this three day event the success it has become. This all started as a way to have a fundraiser that also helps and blesses the community, and it has grown every year. We keep it simple…you shop, you pick the price! There are no price tags, so you give what you want as a donation to New Hope. The annual event is held in the gym at First Baptist Church, 603 W State Street, in Centerville. The doors open on Thursday, June 7th from 2:00 – 6:00 pm, then again on Friday, June 8th from 7:30 am – 5:30 pm, and Saturday, June 9th from 7:30 am – Noon. There will be a Silent Auction for collectibles and higher value items, and fresh Baked Goods will also be available (baked goods are priced). To make this a continued success, We Need Your Stuff, so it’s time once again to start sorting out those closets, garages, attics, and basements. We’re happy to receive anything you have. We ask only that items not be broken and any clothing given be neat and clean. Help to move large items will be available only if needed, on Monday, June 4th – by appointment so call ahead: 641-856-3326. Because this event is intended to help and bless people, we ask that you be respectful of those who truly are in need when you come to shop. Please no gathering of items for re-sale. No early shoppers. We do reserve the right to limit the amount taken by each person so that everyone may have the same chance to benefit. Children must be accompanied by an adult. 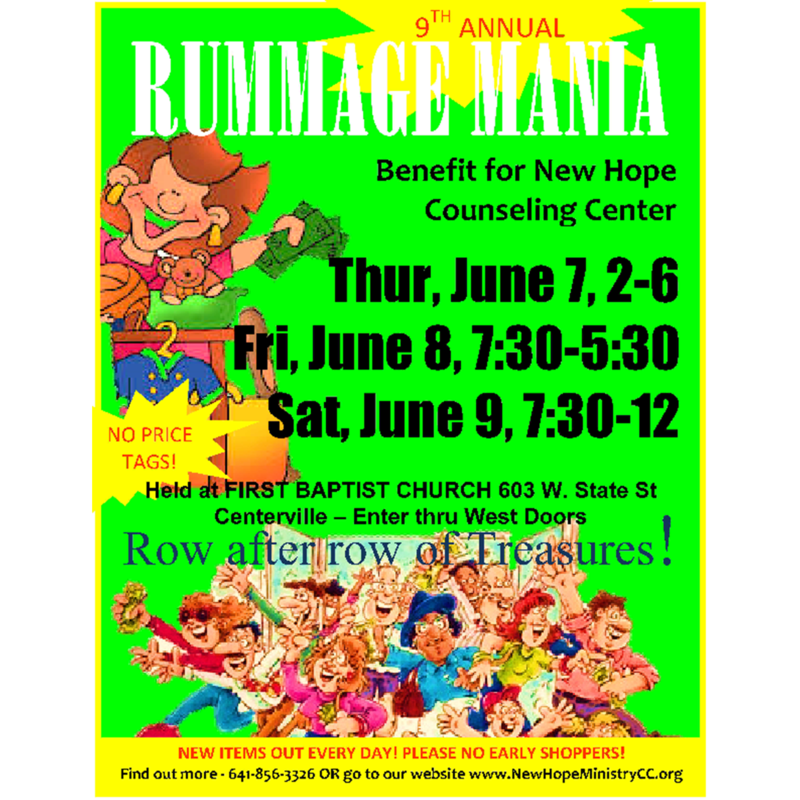 All proceeds from Rummage Mania go to support the local mission work of New Hope Counseling Center, providing Biblical Counseling free of charge, and to help support our other community outreaches: Hope Chest Thrift Store, Hope Pregnancy Center, Hope Loan Closet, and New Hope Prayer Center.